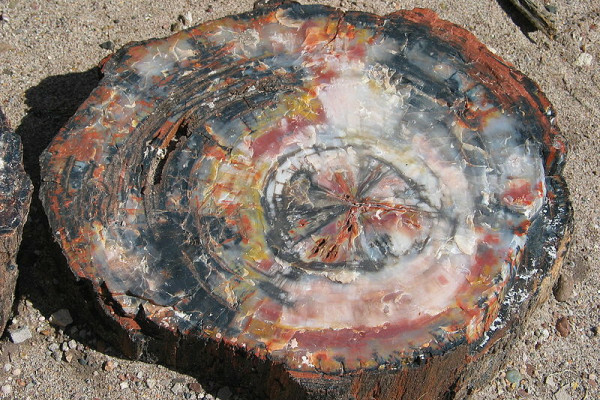 Petrified wood is literally where the wood has been replaced by minerals. Sometimes it has a vague sort of woody texture, it looks a bit fibrous or it's got a ring structure. The best examples will have whole cell structures preserved, the cell walls and the cell interior's filled with mineral. You need to have water of the right chemical composition moving through the wood. It tends to be silica is the best chemical for replacing the wood. It actually reacts with cellulose and leaves a cells structure and gets bound in. Over millions of years it gradually changes from this strange mixture of cellulose and silica into opal and into a more crystallised form of silica. If you just randomly bang fence posts into British soil then probably it would take thousands of years to petrify a piece of wood in anything like normal conditions. If you have a fence post and throw it into, for instance, some of the hot springs in Yellowstone National Park then, yes you might get a decent piece of petrified wood out the end of it. That's very unusual. Previous Do the growth hormones given to animals have an effect on human obesity? Next Is midriff fat worse than other fat?